MOSCOW, March 1. /TASS/. The Kinzhal hypersonic complex capable of delivering missiles to a discharge point within just several minutes will considerably enhance the capabilities of Russia’s Aerospace Force to repel any possible aggression, Aerospace Force Commander-in-Chief Sergei Surovikin told reporters. 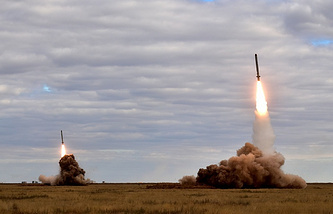 "The Kinzhal system substantially boosts the capabilities of the Russian Aerospace Force to respond to any possible act of aggression against our country and along with other strategic weapon systems will help deter possible adversaries from rushing headlong into action," Surovikin said commenting on President Vladimir Putin’s address to the Federal Assembly. The Kinzhal aviation and missile platform has been developed on the basis of the upgraded Mikoyan MiG-31 aircraft. It is furnished with a precision hypersonic aero-ballistic missile making it possible to strike targets at a distance of over 2,000 km without entering an enemy’s air defense area, Surovikin said. "The fast-speed fixed-wing carrier allows delivering a missile with unique performance characteristics to the area of its discharge within minutes. The main propulsion unit mounted on the aero-ballistic missile accelerates a warhead to hypersonic speed within seconds. The missile’s maneuvering at speeds exceeding the speed of sound by several times allows it to reliably breach all air defense and anti-ballistic missile defense systems that exist or are being developed," the commander said. The all-weather homing head of this most advanced missile will ensure the required accuracy and selectiveness of hitting targets in any time of day or night. "All the test launches of the most advanced hypersonic aero-ballistic missiles that have been conducted have ended with the accurate destruction of the designated targets. From December 1 last year, the first aviation unit armed with the Kinzhal aircraft missile system switched to accomplishing experimental and combat duty missions to practice the fundamentals of its combat use," the commander said.